My third First 4 Figures statue – though like all my previous statues, it won’t be in my possession long. The problem with these pieces is that they’re simply too high value – with their craftmanship and highly limited production run, I can almost never justify keeping them when every time I glance over I just see a giant wad of potential cash. 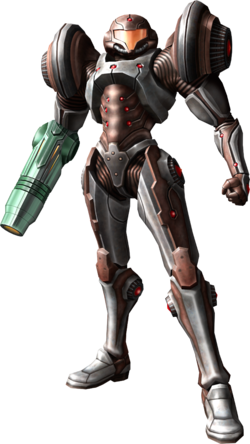 This is First 4 Figures’ first Metroid Master Arts statue, depicting the Light Suit as it appeared towards the end of Metroid Prime 2: Echoes. I even played through the whole game on Hard Mode leading up to the statue release, just to get an email from the company informing me that it had been delayed another few months. Way to kill the hype vibe. I placed my pre-order for this piece nearly two years ago when it was first announced – sent my non-refundable deposit off and patiently waited for this enormous statue to show up at my doorstep. The irony comes when about a week before my payment was due and the shipment was supposed to be sent out, I ran into some financial problems and didn’t have the money available to pay off the rest of the statue. As such, I had to cancel my order and swallow the loss of my deposit. But then, First 4 Figures announced their latest Varia Suit Samus statue…and I immediately pounced on that pre-order because it’s an absolutely amazing piece. And then I got caught up in the Metroid hype and decided I needed the Light Suit in my life again, so I re-ordered it online, got on the Wait List, and played the waiting game until two weeks later they notified me my order was converted to a guaranteed order. I basically gave up my earlier place on the order list for no good reason and lost my deposit when I didn’t need to because I made a decision I immediately regretted and ended up ordering the statue anyway. Ended up with #735/1000 – if I hadn’t cancelled my first order I probably would’ve ended up with a much lower number. Not that numbers really matter that much to me though. The box has a nice little blurb on the character and statue highlights. I’m glad First4Figures is really stepping up their game with their shipment packaging. They even do drop tests with the statues in their shipper boxes to make sure nothing breaks even with the roughest of postal service handling. An interesting thing to note about the artbox is that nowhere on it does it say this is the Exclusive edition except for in the fine text on the back. You’d figure there would be big bold letters telling you which version of the statue this is, but it’s simply left implied due to the “lights on” variant on the boxart. The regular version does not have the lit lights effect. Big ‘ol Styrofoam packaging inside the artbox which was inside the shipper box. It’s like peeling back layers of an onion to finally get to the grand prize inside. There she is, wrapped in all her safe glory, Arm Cannon detached at her side. A second Styrofoam layer holds the dedicated light-up base. And of course, all First4Figures statues come with a collectable credit card (valid only at participating retailers within a 30 day period) with an authorization number that you can register with on their website to claim the statue number for your own. This system allows you to guarantee that you get the same numbered statue that’s next in the series, though I personally don’t care for this feature. So this statue apparently was plagued with some troublesome production issues – the several months delay in shipment for the second batch was the first indicator, but even the final products arrived with some defects. A lot of owners reported quickly that their statues weren’t lighting up – that the only lights working were those in the base. A solution was then reported just as quickly – the problem seemed to be paint that was left on the metal connectors, blocking the contact points and disallowing the LEDs to activate. Knowing that this was a common issue, I immediately took a pair of scissors and gently scraped off the excess crud on both Samus’ feet connectors and the Arm Cannon peg. Sure enough, my first test of the lights ended up successful – for the suit at least. The Arm Cannon still didn’t light even after I scraped some paint off, so I disconnected everything and went at it again, scraping more down to the base. The second time I plugged it in everything worked – let there be light! Samus is rendered in an absolutely massive 1/4 scale – pictures don’t do well to convey her size. The best I can do is suggest grabbing a tape measure and drawing out 20 inches vertically – she’s that tall. As with all of First4Figures’ works, the Light Suit is made from polystone resin, which means it has quite a bit of heft and weight to it. This also makes it pretty delicate though – I’m scared to death of one of her fingers snapping off, but as long as you handle her carefully it should be fine. The details on the statue are nice – the big white parts of the armor are a gorgeous gloss white, and the bits of shading here and there really bring out some of the more indistinct edges and shapes. The feet do plug fairly snugly into the base, though the fitment isn’t quite perfect. There’s a small gap, probably only a millimeter wide, under the left toes but it’s basically unnoticeable. The base is actually based on the elevators found around in Metroid Prime 2: Echoes, though after actually playing the game through again it’s kind of interesting to note that all the elevators featured in-game have some reddish growth or extra designs strewn about them, while the base featured here is basically a “clean” elevator. Paintwork in general is clean and well done. The metallic green on the Arm Cannon really is an attention-grabber. I particularly love how well it matches the color and view we’re so familiar with during Prime‘s first-person player point of view. 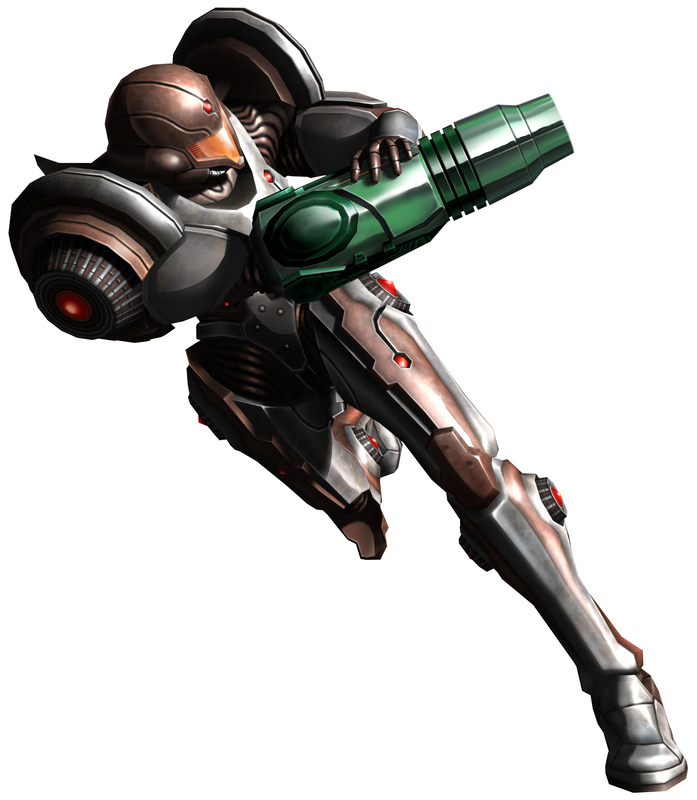 The only thing is, the Arm Cannon simply slots into the metal connector prong in Samus’ right arm, and it’s angled downwards. There’s no locking mechanism or anything – it’s just a friction fit, and sometimes it feels loose. I can push it in as much as it’ll go, but all the same it’s kind of terrifying because I imagine some slight shaking would probably shake the cannon loose and send it tumbling down. The base is interesting – from the way it’s painted you wouldn’t think it lights up at all. The paint looks solid and there’s even already a sort of “light-up” effect painted in. The chest orbs that light up have some designs tampo’ed on them that stay faithful to the in-game design. The underside of the base, with edition size and number. All the suit details are there – there’s a lot in the design that I never even paid attention to before, like the ridges on the lower back. A small button on the back of the base controls all the lights in one touch – the power source (three AA batteries) is located in there as well. At first I was a little put off that they made the visor and chest lights different colors – it didn’t feel right not to have them match. But then I played through Echoes again and realized that they are indeed different colors in-game – most of the lights on the suit are actually supposed to glow yellow, while her visor glows white, though it’s usually opaque to show Samus’ eyes. The barrel of the Arm Cannon also glows a yellow-orange, the tell-tale glow of the basic Power Beam used in-game. I’m actually really grateful that they also decided to light the stripes on the top of the Arm Cannon too – however subtle it is – it would’ve looked boring with just the barrel lit. Kudos to First4Figures for always nailing the details. You normally wouldn’t be able to see the back of Samus’ hand in this statue’s pose, but it’s lit anyway. I honestly think the four lights on the back are some of the coolest things ever. Maybe because they look like thrusters, or maybe because I’m just not used to seeing the back of the suit, but the layered look with the lights shining through is just kickass. The base is lit here, but it really doesn’t look too different from the unlit version shown above, right? It just has a slightly bluer glow. And just for some fun, let’s see how the Light Suit performs as a nightlight. The base doesn’t look very lit under regular light, unlike the rest of the suit’s LED functions, but it certainly has some good reach in total darkness. It looks like there’s some light bleed in the hand LED. The paint seems like it’s really thin on the left hand for the light to be visible from the other side. Also quite a bit of light bleed on the back, but this is a bit more understandable due to the staggered design and nature of the backpack. I was most worried about the visor light being overpowering and overwhelming the rest of the lights when lit in total darkness, but that doesn’t seem to be the case here. It’s at just the right intensity to still be the focal point of the statue in darkness while not blinding out anything else. The Arm Cannon light also isn’t quite as bright as the previous light-up Samus statue’s was. Unlike the Phazon Suit, it doesn’t quite act as a mini-flashlight here. Size comparison with my custom Light Suit Samus Figma. They’re basically twins. A moment to talk about this statue’s pose though – I’ve heard rumblings abound about how unimaginative and boring the pose for the Light Suit is, when ironically it was pulled directly from official game art. The render above is the official Nintendo promotional art for the Light Suit, and given that this statue is licensed by the Big N themselves and had to go through their approval before production is ever even considered, it’s no wonder that First4Figures would decide to go with the official artwork pose. Is it kind of boring? Yeah, I think so – an action pose would’ve been a lot cooler, but I can definitely understand the reasoning behind the sculpt. The good news is that the new Varia Suit Statue pose more than makes up for it, and with any luck in the future we’ll get some exciting stuff based off of the Dark Suit’s official art (though two official pieces exist for that suit, with the stoic one more likely to be made into a statue). As gorgeous as this statue is though, I unfortunately will have to part with it just as I have all my previous Samus pieces from First4Figures. Each of them make absolutely jaw-dropping display pieces on their own, and a collection would be even more awe-inspiring, but it’s tough to justify keeping them when they’re simply worth so much in cash. I like the Light Suit, but when it boils down to it it’s still not the iconic Samus I can justify keeping around as a financial investment. The upcoming Varia Suit though? That’s a different story.